Adam reviews the newest GKIDS release A Town Called Panic: The Collection which collects Christmas Panic, Back to School Panic and twenty original Shorts Starring Indian, Cowboy and Horse. GKIDS has gone all out housing everything with the exception of the 2009 movie into one collection. A Town Called Panic is a shot of giddy over-caffeinated mania that one will either love or hate. Much of the delight will depend on your love of anarchistic humor. The twenty original shorts and two “specials” that comprise of A Town Called Panic The Collection are not designed to teach children good manners or another language or anything for that matter. Part of the joy in A Town Called Panic is in the Tom & Jerry of it all. Cowboy and Indian are unruly children that Horse must care for and often times admonish for their stupid behavior. That is the unchanging dynamic is brilliance and core of series. Over the course of the twenty short films Indian and Cowboy manage to among other adventures rig a cycling race, kidnap a donkey (and hold for ransom), unearth the 1986 Mexican World Cup team and eat a radioactive meteorite turning into the Hulk. This is where in lies the joy of the series and the two specials. They are animation for the sake of animation. Funny fun for the sake of funny fun. There isn’t some lesson to be weaned from these two morons. Well maybe there is, like the basic; do not do anything these two dummies are doing. Part of the joy derived from, A Town Called Panic in all its forms (there is also a brilliant movie, not included), knowing that Indian and Cowboy are some of the dimmest bulbs in all of animation-dom. This is evident in the TV specials that eschew the conventional trappings of their genres. Christmas Panic and Back to School Panic are as setups for blowing up the genres they’re partaking in. Christmas Panic have Indian and Cowboy attempting to save Christmas (e.g. get their gifts from Santa) by stealing a Christmas Log (which is a rolled chocolate and crème cake) from Steven and his family (their neighbors). Back to School Panic sees Indian and Cowboy attempting to win a flight to the moon by stealing the answer to a question from the others at school. These seemingly trite setups lead to some of the best moments of surreal comedy in years. I have had a greater joy than seeing Indian and Cowboy being chased inside a pig’s head after they’ve shrunk themselves to steal a secret. A head that houses an entire community of pig-related stores, cars, even other pigs, think a cruder Inside Out. Though Indian and Cowboy may be hellions they are never cruel. There is always an innocence at play in the entire series. Yes, Horse manages to kick them into walls but it never hurts them and they always understand they are completely in the wrong. One could see A Town Called Panic as what it is; the representation of a child’s truly anarchistic spirit. A Town Called Panic represents more of how unruly children are that anything that’s been put on screen in the last ten years. The over-caffeinated unruly child’s thought process of A Town Called Panic makes it in its many forms a rare breed of animation; an anarchic beautifully innocent piece of animated mania. GKIDS’ presents the entire collection, including the shorts, with pristine transfers. Each of the twenty shorts and two specials are perfectly rendered on the disc. 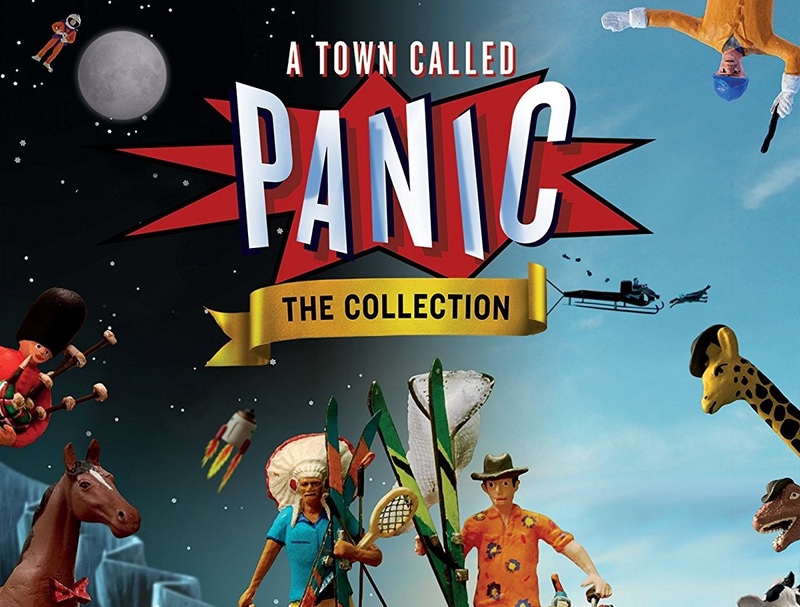 A Town Called Panic: The Collection is a worthy entry for any animation fan and any fan of great art period. Highly recommended. GKIDS’ A Town Called Panic: The Collection will be on Blu-Ray on December 19th.